The “nuclear option” refers to a move by the majority party in Senate — in this case the Democrats — to change the Senate rules to allow most executive branch and judicial nominations to be approved with a simple majority – 51 votes — rather than the 60 votes now required. Under longstanding rules, the minority party has been able to block a nomination with just 41 votes, commonly called a filibuster. “Nuclear option” typically refers to an option so drastic it must only be used as a last resort. Former Sen. Trent Lott (R., Miss.) was the first to use it in this context, and the name has stuck for several reasons. First, changing the Senate rules would both fly in the face of longstanding precedent and likely inflame partisan tensions in the body. Also, the Democrats know that when the majority party becomes the minority party, as inevitably happens, that party would be stripped of most of its leverage, thanks to its own rule change. After a standoff earlier this year in which the threat of the nuclear option was raised, the Republicans in the Senate have recently blocked three nominees to the U.S. Court of Appeals for the District of Columbia Circuit and an executive branch nominee, Rep. Mel Watt (D., N.C.), who was nominated to head the regulator of Fannie Mae and Freddie Mac. All of the nominees would likely be confirmed at the 51-vote majority threshold as Democrats currently control the Senate 54-46, including two left-leaning independents who caucus with the Democrats. What would be the broader impact of the rule change? The change would curb the minority party’s main source of leverage in the Senate’s frequent battles over confirming the president’s nominees to executive and most judicial posts. Republicans, now in the minority, have often required a 60-vote threshold to consider nominees. The change under consideration would allow a confirmation to proceed with just 51 votes, which the Democrats can reach without any Republican votes. Are there any exceptions to the proposed change? Yes, the Democrats’ rule change allow the minority party to demand 60 votes to advance Supreme Court nominations. But Republicans warn that once the rules start changing, there is no guarantee that the carve-out for the Supreme Court will hold up. Sen. Charles Grassley of Iowa, the top Republican on the Senate Judiciary Committee, said Wednesday that Democrats cannot expect to change the rules for lower court nominees and still preserve the right to filibuster a Republican nominee to the Supreme Court if the GOP wins the presidency and Senate in 2016. 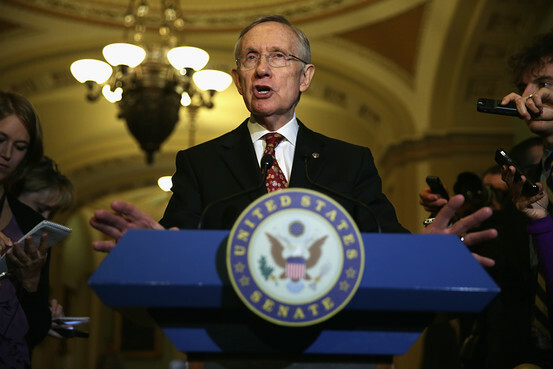 Have senators threatened to use the nuclear option in the past? Politics Alerts: Get email alerts on breaking news and big scoops.